I quite often get a sense that when choosing a wedding reception venue, the evening reception party (let’s call it the ‘disco’) is not high on the list of priorities. Obviously, there is a lot of factors to take into consideration to ensure your wedding day is as good as it can possibly be. However, I do get a sense that some key elements to evening reception (which is the single longest section of the wedding day) do sometimes get overlooked. 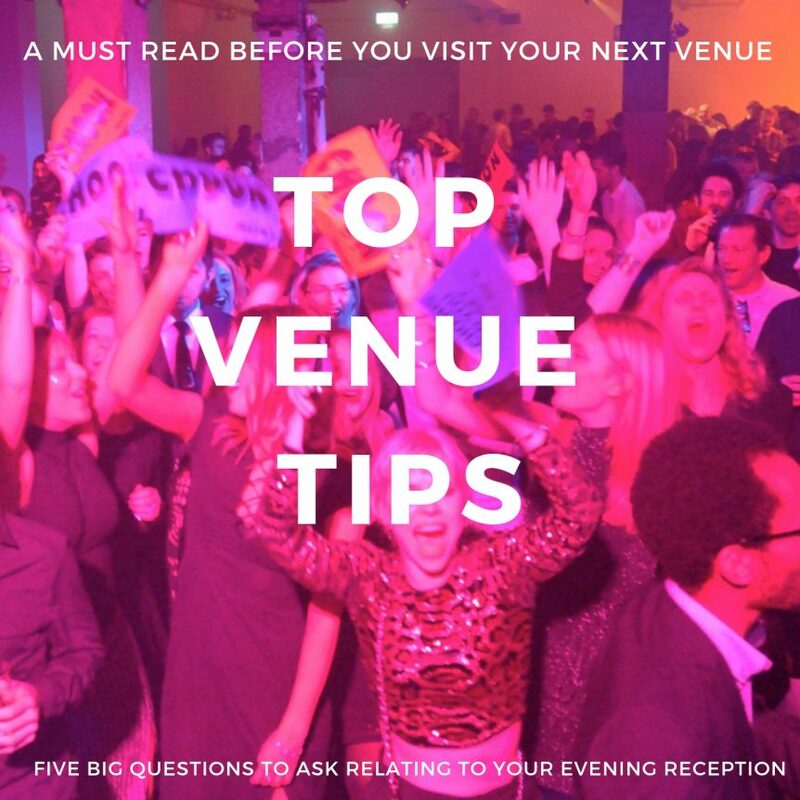 With this in mind, here are my 5 top tips to help you ask the right questions when you are booking your venue relating to the evening disco/soirée/rave-up. Sound limiters are commonplace at many a wedding reception venue and to be completely honest are the bane of a DJ/band’s life. Now I don’t have a problem with them in principle….no actually I do! They are a massive pain in the bum. The biggest bugbear I have with them is that some venues have them set so low (sometimes they are legally told to do so) that they have no right (in my opinion) in selling their venue as a viable wedding reception option. It sickens me that they charge thousands of pounds for the use of their space and when everyone is all psyched up after a fantastic day the evening reception disco limps along due to the low-level sound restrictions that have been pre-set. 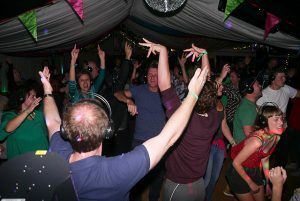 It can be a massive anti-climax with the DJ being on the front-line and getting persistent requests to ‘turn it up’, knowing that by doing so will either set the limiter off which will automatically dampen the sound down or worst still cut the power off to the DJ equipment bringing the whole show to an awkward halt until it resets itself. Not great for the dance floor, DJ or of course the wedding couple’s celebrations. My advice to anyone who is planning to have a DJ or band or both (which is the majority) is to check to see if there any sound restrictions already in place, and if there are, what are they? 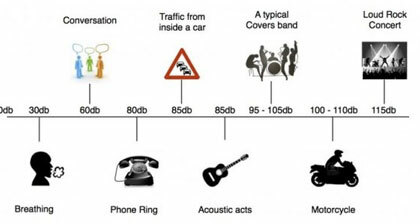 See the chart to get a rough idea of noise levels but there are a lot of factors to take into consideration like speak placement, size of room etc. 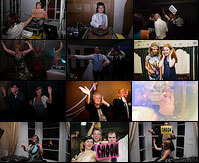 If possible try to see an event in action (wedding, corporate function etc) as a demonstration. Sound checks in empty rooms are no good, as this will not give a true representation of what it will be like on the day with 100+ guests jumping about and making a noise. To avoid any disappointment it would be my No.1 piece of advice. If the venue is perfect for all the other reasons you have on your checklist but fails on the noise issue one way to get around this is to hire in ‘silent disco headsets’ for everyone. 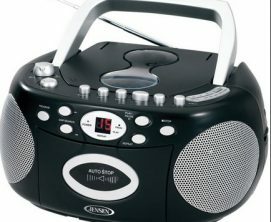 It could add a couple of hundred pounds to your entertainment budget but will solve any noise issues (apart from the bad singing) as your guests will each be able to don a pair of headphones to wear on the dance floor and boogie away to their heart’s content. A novel but extremely fun way to enjoy good music as it was intended. 2. Is the bar in the same room as the disco? 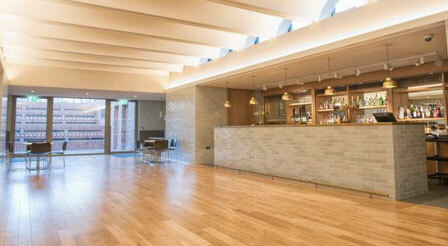 Ideally, if possible, a wedding reception venue where everything is in the same room is best. Nothing splits up a party more than having a bar in another room. If the bar is in a separate room enquire to see if a portable bar can be set up in the main room, even if it only offers a stripped-down selection. Please bear in mind the more areas you have open (garden, games room, bar, room for the buffet, lobby etc) to your guests the more they will be dispersed. Sometimes it might be a good idea to close the space down so you can provide a more intimate, atmospheric party whereby all your guests are mingling together. Are your guests going to rattle around in it after the dinner? Think how you can utilise the space. Are you booking other suppliers/services? A photo booth and an evening buffet for instance. Can both be set up in the main room? Another good tip to close down the space i.e. not to remove too many tables after dinner. This will limit the amount of floor space people can occupy and help push people together. From my experience, the majority of wedding timings get pushed back as the day progresses with photo shoots taking longer than expected, possible delays in food service and of course the best man’s speech taking forever to finish. 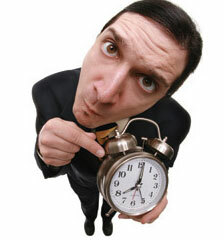 This results in the evening reception starting later than planned, so do factor-in these possible delays into your timings as one thing that won’t shift back is the curfew time. That will be set in stone by most venues. If you’ve planned a lot for the evening (i.e. DJ, band, buffet, photo booth etc.) this can all get squeezed into a shorter space of time for you and your guests to enjoy and you may feel that you’ve not got your money’s worth with the evening flashing by in the blink of an eye. Quite often this is absolutely fine but make sure you ask a couple of questions beforehand; Has the equipment seen better days, been well maintained and can you have a demonstration to hear/see it in action. Any professional DJ worth their salt will be happy to accompany you (providing they are reasonably local to you and the venue) and give their recommendations on its suitability. 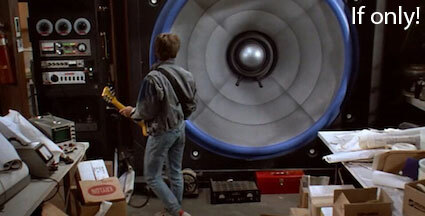 – The other question to ask is whether the equipment is linked into a sound limiter. More times than not this is the reason they’ve insisted you plug into their system. Please refer back to point 1 above and make sure it’s worthy of your wedding party and doesn’t resemble a portable stereo. 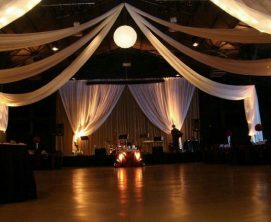 I hope the above points will help you ask the right questions when sourcing a wedding reception venue for your big day to ensure that there are no hidden surprises and you get the party you ultimately want. I’m happy to help in any way with advice and thoughts, although I won’t profess to have all the answers. Additionally, if you’d like me to contact a potential wedding reception venue on your behalf I’d be happy to, even if you decide to go with another entertainment supplier. Just drop me an email to rob@stickiton.org.uk and I’ll do my very best to assist you. All the best with your wedding planning. Rob is founder and owner of unique and alternative DJ entertainment concept ‘Stick It On‘ which turns the guests into DJ superstars by getting them to play three of their favourite tracks, under the close guidance of their helpful crew.